Introduction (Paul Portner and Barbara Partee). 1. The Proper Treatment of Quantification in Ordinary English (Richard Montague). 2. A Unified Analysis of the English Bare Plural (Greg Carlson). 3. Generalized Quantifiers and Natural Language (Jon Barwise and Robin Cooper). 4. The Logical Analysis of Plurals and Mass Terms (Godehard Link). 5. Assertion (Robert C. Stalnaker). 6. Scorekeeping in a Language Game (David Lewis). 7. Adverbs of Quantification (David Lewis). 8. A Theory of Truth and Semantic Representation (Hans Kamp). 9. 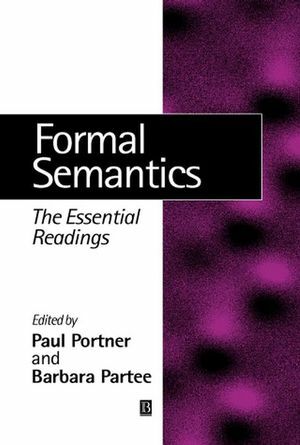 File Change Semantics and the Familiarity Theory of Definiteness (Irene Heim). 10. On the Projection Problem for Presuppositions (Irene Heim). 11. Toward a Semantic Analysis of Verb Aspect and the English 'Imperfective' Progressive (David R. Dowty). 12. The National Category of Modality (Angelika Kratzer). 13. The Algebra of Events (Emmon Bach). 14. Generalized Conjunction and Type Ambiguity (Barbara Partee and Mats Rooth). 15. Noun Phrase Interpretation and Type Shifting Principles (Barbara H. Partee). 16. Syntax and Semantics of Questions (Lauri Karttunen). 17. Type-Shifting Rules and the Semantics of Interrogatives (Jeroen Groenendijk and Martin Stokhof). 18. On the Notion Affective in the Analysis of Negative-Polarity Items (William A. Ladusaw).